Served over polenta. Crazy tasty. When you've got farm fresh tomatoes and are looking for a quick easy no-cook tomato sauce, look here. A jar of capers lives in my fridge, and if I put up enough, I have a cube or two of pesto left in the freezer until my basil gets going in the summer. So when I get ripe tomatoes, I'm good to go. This was fast, easy, and tasty. Try it! This is it. I did not forget anything! Some of the tomatoes look like plums. Love my CSA! Chop the tomatoes into a small dice. Give the tops to your composting pigs (or compost them, or chop them up as well--I'm talking about the tomatoes, not the pigs). 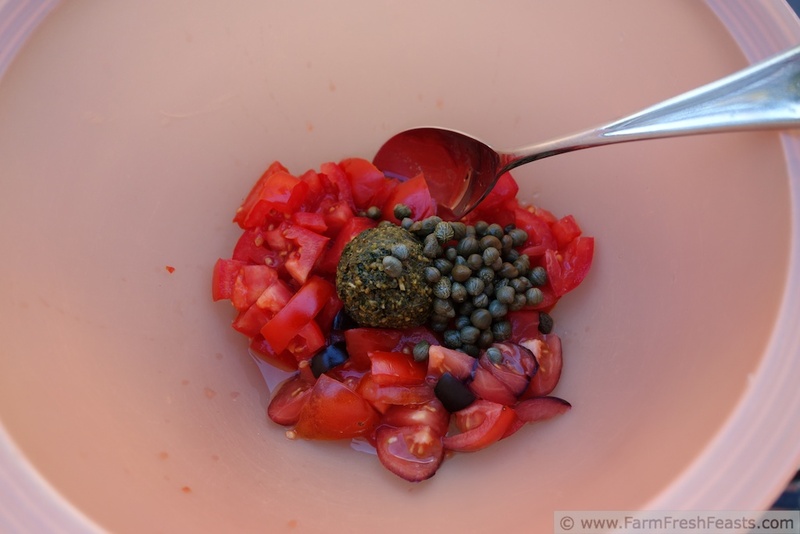 Place tomatoes and any accumulated juice in a bowl. Add pesto (straight from freezer is fine!) and capers. Stir. Let sit on the counter while you take the kids to the dentist, or for at least an hour. Serve over polenta, or eat straight from the bowl. This sauce is joining the crowd at What's Cookin' Wednesday, the Wednesday Fresh Foods Link Up, What's In The Box, the From The Farm Blog Hop, the Clever Chicks Blog Hop, Tasty Tuesdays, Food on Friday, and Mostly Homemade Mondays. NOTE: Whatever you do, don't use more tomatoes without using additional pesto and capers, and don't stick your immersion blender into it because your daughter doesn't like the idea of capers or chunks in her tomato sauce. It will turn out yucky. Trust me. Let her eat something else and enjoy this sauce as above. Not below. 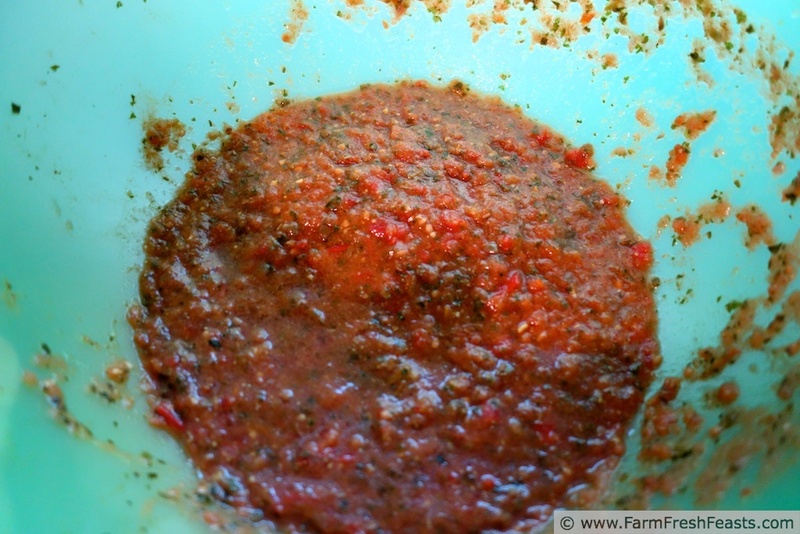 What a perfect summer tomato sauce! Can't wait until we start getting tomatoes so I can try this recipe. I'm delighted that my farm share has hoop houses to start their tomatoes earlier, because I've been eyeing the ever-growing yet still green tomatoes in my garden with undisguised lust. I went away for the weekend and was SURE I'd come home to a ripening tomato, but no! It's just bigger, and still green. Ah, well, good things come to those who wait. I love this tomato sauce. And you better believe I am going to give this simple recipe a try. YUM. If you try it, I'm pretty sure you'll love it. The flavor is just terrific. I'm eyeing it for pizza potential now. And a mango mojito would make me happy--I'm willing to trade . . . ? I think I need to ask, "Were any composting pigs harmed in the writing and creating of this post?" I love CSA tomatoes in the summer time. We've been getting one beefsteak tomato every single week and sometimes a handful of grape tomatoes. In either case, it's never enough because it gets used and eaten so quickly. Each week, I've been trying to hold off for a Caprese salad and I never seem to make it. Maybe today is my day. Although who knows, they may end up in this sauce. Speaking of which, I need to make more pesto. I may a Basil Aioli this weekend although I'm not sure how good it will turn out. The flavor was great, but the consistency not so much. Too liquid-y so I froze it in hopes of solidifying it. I bow before your Aioli--never attempted such a feat myself. No composting pigs were harmed, exactly, though if you'd seen them after I made this (you notice no tomato tops are in the bowl--the pigs got them all) you'd think there was a bloodbath going on, with all the red juice running down their little pig chins. I need to thaw a ball of mozzarella for potential caprese--I saw a Caprese Bread Pudding on Kate's blog Diethood during my blog catch up frenzy today that I need to recreate in the wintertime. I'm always interested in a new link party--thanks for inviting me! Yum! 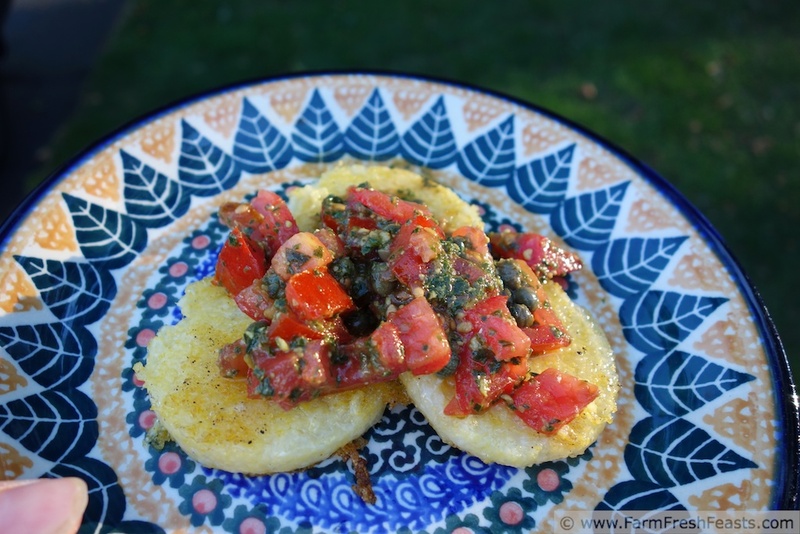 Perfect for in-season tomatoes in all their summer deliciousness! Thanks for the recipe! You're very welcome--it's easy and delicious and I couldn't keep it to myself! Whatever form it comes in, looks mighty delish to me! Thanks! We had the sauce on last night's pizza and it was very yummy--polenta, pasta, pizza . . . it works with all the P things I've tried.